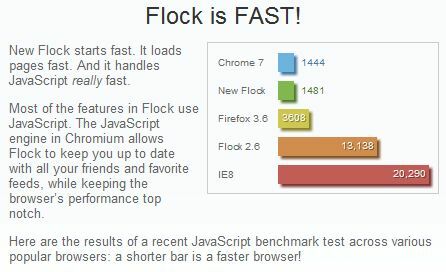 It showed that Google Chrome and the latest Flock browser are the fastest The older Flock is based on Firefox. But I suspect Flock uses the same Chrome engine (I read Chromium engine which I think is the same). The sidebar is the hub of activity in Flock. It keeps you informed with feed content and social streams so you don’t have to leave the web page you are on. As soon as you sign into your social services and/or subscribe to RSS and ATOM feeds, the sidebar starts delivering what’s new with your friends and favorite content. Each activity in the sidebar has options for joining the conversation, or passing along the information to others. Hover over any activity and you will see the the options you have to comment, reply, share or post. Who says you can’t take it with you? Flock provides you the option of creating a free account that stores your favorite sites and feeds, your social networking accounts, and all the groups you make for your sidebar. You can access your account from any Flock browser. The sidebar works like the channels on a TV. Use the “channel changer” drop down menu at the top of the sidebar to see just friends on Facebook, just friends on Twitter, all friends, just feeds, etc. But this is better than TV, because you can create any channel you want! Every Flock account includes a Profile page. It starts out set as private, until you visit it and switch it to public. Every time you favorite a web site or subscribe to a feed you have the option to add it to your profile page. When you upload photos, post status updates, favorite videos and tweet, this stream is added to your Profile too. Share your my.flock.com/username link with anyone you like! Access your stuff from any browser, from anywhere. Choose "Edit your groups" from the channel changer, and create a new group... then type in the names or drag and drop the people and feeds you want in your group. Done. As soon as you have made a group, they are instantly added the the channel changer in the sidebar. You can monitor the streams that matter to you, whenever you want to. If you haven’t used RSS feeds before, you might want to start. Any time a web page offers a feed (and more and more do), you’ll see a little green icon in the right of your address bar. Click it and load the feed into a simple feed reader page in Flock. If you push the "subscribe" button in the feed reader, content and information from this site will automatically flow into the Flock sidebar and keep you up to date. Feeds you subscribe to also become available to include in any Flock Groups you create.